Never listen to hype, boys and girls. It gives unrealistic expectations at best, and at worst may lead you to make the same mistake I did the first time I heard Deconstruction. According to everything I read, this would be the heaviest thing Devin has ever made, and I duly went in expecting to hear Strapping Young Lad’s Shitstorm extended to album length, a dizzyingly brutal sonic scream with all the weight of human insecurities and neuroses behind it. Instead, I heard a silly album about cheeseburgers set to Meshuggah riffage with a full backing orchestra. 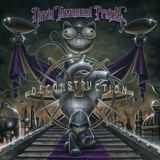 Deconstruction is not the heaviest thing Devin has ever done, far from it – but it is the most over-the-top album he’s ever done, and the difference is huge. Devin’s sense of humour has never been a particular pull for me in terms of its effect on his music, the likes of Ziltoid being all the poorer for it to these ears. So it’s taken time and many listens for me to come around to his viewpoint when it comes to this latest part of the Devin Townsend Project, which otherwise ticks all the right boxes, from the rather fantastic list of guest musicians to the songs themselves. Ultimately, this desire for heaviness is fulfilled in style, but you have to wade through a fair few songs to get there, and it’d be too easy for those without patience to reject it too soon. That would be a huge, huge mistake. It’s a very difficult album to get to grips with, starting relatively slowly with Praise The Lowered, Devin’s croons instructing the listener to ‘close your eyes, get ready’ with guest backing from Novembers Doom vocalist Paul Kuhr before building into a typically-deranged crescendo, ambiently fading into the following Stand. That is probably the most typically Devin Townsend track present, proggy verses turning into strident clean-yet-heavy chorus, lengthy soloing, etc – there’s apparently a guest spot from Mikael Åkerfeldt somewhere in the mix, although it’s quite hard to pick out, as are all the guest spots. As the album continues, the heaviness builds, the thrashy orchestral chugging of Juular (guest spot from Ihsahn) building into the moments of lunatic heaviness I was looking for, as does the Meshuggahiffic Planet Of The Apes which twists and turns in very satisfying prog-infused ways. Although this is more than heavy at most moments, the lightning speed is generally missing in favour of a mid-paced stomp that works for what it is, but seems a little too carefully controlled for a man capable of unleashing chaos as well as Devin is. You have to listen closely to uncover the album’s secrets (“we all rip off Meshuggah” admits Devin in Planet Of The Apes) and let the (sometimes subtly) proggy aspects of the song structures work their magic. Both Joe Duplantier (Gojira) and Paul Masvidal (Cynic) appear on Sumeria, fitting into the song’s operatic light-and-dark structure well – yet even with all this, it takes the sixteen-minute The Mighty Masturbator until you really begin to understand the album’s focus. Operatic metal with all the grandeur and glamour supporting rather than hindering the underlying metallic crunch, dips into electronica and vocal-led humorous asides at their best as they build and guest Greg Puciato (Dillinger Escape Plan) is revealed in backing screech mode. From then on, the album is at its best, from the wild speed of Pandemic with operatic trills from Floor Jansen (ex-After Forever, ReVamp, Star One) to the toilet humour that opens the title track, a cheeseburger-obsessed modern thrashing masterpiece that moves ferociously in its comedic attack. There’s a story about a man journeying to hell and being offered a cheeseburger of wisdom buried somewhere here, only to reject it for ‘vegemetarian’ reasons – not exactly Dostoyevsky, but in Devin’s hands this makes perfect sense, and Oderus Urungus’ guest spot (GWAR) is the perfect choice. “Let’s finish this!” cries Devin at the start of album finale Poltergeist, and the ensuing roar is just divine, doing just that in style. Expecting insanity from a man who claims to have left insanity behind may have been foolish of me, but it’s hard not to fall in love with Deconstruction along the way as you give it multiple listens and discover new things each time. In the end, criticising the album for not being what I want is silly, and whilst I could have shed further paragraphs on the disappointly brief appearances of Ihsahn and others, this is Devin Townsend’s album through and through. All of his various interests, obsessions and flashes of humour have been gathered and formed into a metal album that touches on progressive and operatic territory with merry glee, deliberately wacky music that teases and touches in equal measure. He’s done it again, of course – precisely what it is that he has done will take many, many listens to work out, however. It’s all just entertainment, folks, someone once said, and although Hevy Devy’s music often surpasses mere entertainment for me, it’s when viewed from that angle that Deconstruction, finally, makes a sort of sense.